The secret of bridleless riding - It is not about the bond! “What an amazing bond!” says a random horse person after watching a video of a horseman doing X and Y with a horse without saddle or bridle. So what does “bond” means? A bond can be a rope, chain or another form of restrain used to hold someone or a common feeling that unites two individuals. When people say “What an amazing bond” they most likely mean something along the line of “what an amazing relationship”. Regardless of how the horse learned to perform X and Y behaviour, I always found it bizarre for people to comment on the bond between horse and human after watching a training/riding video. 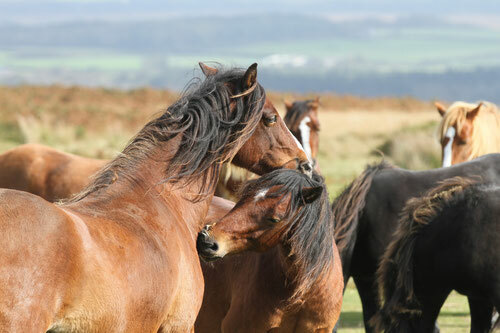 Is having a bond with a horse all about what the horse can do for you? Here are two pictures of me with my horses doing two very different things. The first one shows a really well trained horse performing a desired behaviour, the second shows a non-trained, spontaneous affiliative behaviour. For me, only the second one could really fit the caption of “what an amazing bond!” even if I have a very good relationship with both horses. So what are affiliative behaviours? Affiliative behaviours are behaviours that promote cohesion between individuals, that support and improve the bond between two or more individuals. Affiliative behaviours include touching, mutual grooming, licking, sharing personal space etc. You can judge how close two individuals are to each other by how many affiliative behaviours they share. Now to go back to the video of the horse doing X and Y without a bridle; this is not trust, this not an amazing relationship, this is the end result of training. And it is not because you can achieve any of it that the horse likes you. There are two ways of achieving bridleless riding: through positive reinforcement (which is what we promote on this website) or through negative reinforcement (which is sadly how it is done in both traditional and natural horsemanship circles). Because the negative reinforcement approach is the mainstream approach, I will explain it in details. Please remember at Fairhorsemanship we do not agree with this way of training horses, there are reasons for that so do not use the following as a way of learning how to do bridleless riding with your horse. Instead learn about positive reinforcement! There are two main ways horses learn, through operant conditioning and through classical conditioning. 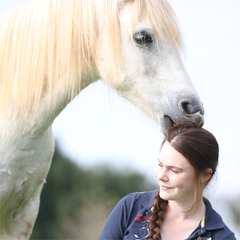 With operant conditioning the horse learns through consequences: the trainer reinforces wanted behaviours using reinforcement, and punishes unwanted behaviours through punishments. They are 4 types of operant conditioning: positive reinforcement, negative reinforcement, positive punishment and negative punishment. 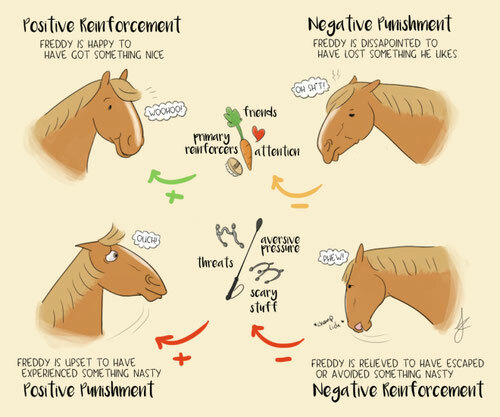 The 4 types of operant conditioning, illustrated by Fed up Fred. Negative reinforcement focuses on removing aversive stimuli following a desired behaviour, making the behaviour more likely to occur again in the future. The rider pulls on the reins (aversive stimuli), the horse stops (wanted behaviour) and the rider stops pulling (aversive stimuli is removed). The rider kicks the horse (aversive stimuli), the horse moves forward (wanted behaviour) and the rider stops kicking (aversive stimuli is removed). Another important type of learning is classical conditioning, which is basically learning through association: a stimulus gains the capacity to evoke a response that was originally evoked by another stimulus. Here is a very simple example of classical conditioning: A horse owner drives up to the farm every morning, opens the squeaky door to the feed room and brings hay to her horse. The horse nickers when he sees his owner approaching with the hay. After a few days of the same routine the horse starts nickering when he hears the feed room’s door. In this example, the door of the feed room causes the horse to nicker, a response that was initially only evoked by seeing the hay. By having the door of the feed room closely associated with hay several time, the horse has learned that squeaky door = hay. This is classical conditioning at work. 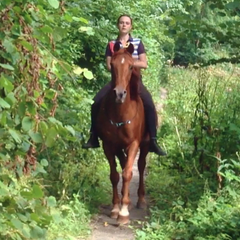 So now to go back to bridleless riding. Once the rider has taught the horse the cues for moving forward, stopping and turning with negative reinforcement. He then uses (most time without knowing) the principle of classical conditioning; he closely associates the original cue with new cues. These new cues can be whatever the rider wants, a pull on a neck rope, a change in body position or even a verbal cue. It doesn’t matter. As you can see, it has nothing to do with relationship and all to do with training. This is even truer if you use aversive stimuli (negative reinforcement and positive punishment) to train and ride your horse because one of the main drawbacks of using negative reinforcement is that it damages horse/human relationship due to the human being associated with aversive stimuli. To learn more about a better way of training your horse, check out this article on positive reinforcement.